Garrett Neese/Daily Mining Gazette At Hancock’s recycling center, residnents are able to take compost out of the system, City Councilor Will Lytle said at a Thursday forum on recycling. 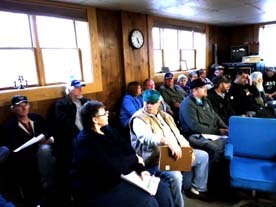 HOUGHTON — Houghton and Hancock both began recycling contracts with Waste Management in 2016. 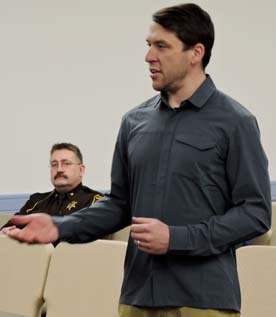 Representatives from the cities briefed residents on their programs during a Thursday forum at the Portage Lake District Library hosted by the Copper Country Recycling Initiative. Houghton began its curbside recycling in the summer of 2016 through Waste Management. Before that, the city had a grant with Waste Management for a drop-off system. After the city put out a request for proposals for recycling, Waste Management was lowest responsible bidder for the services. Waste Management helped line up a vendor from which the city got 400 recycling containers. It sold them to residents for a one-time fee of $10. Garrett Neese/Daily Mining Gazette “People by and large want to recycle, but they don’t always know the best way to do it, or what they should recycle,” Houghton city manager Eric Waara said at a Thursday forum on recycling. “A lot of people wanted us to give them away, but then the problem is if you give someone something they don’t value it,” Houghton city manager Eric Waara said during his presentation. After the initial run sold out quickly, the city received a state Department of Environmental Quality (DEQ) grant to purchase an additional 300 residential as well as streetside containers for spots such as Dee Stadium. Contamination — the inclusion of unrecycleable goods — isn’t a large problem, though it is persistent, Waara said. “People by and large want to recycle, but they don’t always know the best way to do it, or what they should recycle,” he said. A list of acceptable and unacceptable recycling items in Houghton and Hancock can be found at cityofhoughton.com/info-recycling.php or cityofhancock.com/info-recycling.php. Waara shared his request for proposal with Hancock and any other municipality interested in using it as a basis for their proposal. When Houghton’s program began, recyclables made up between 18 and 19 percent of residential tonnage, and has improved to around 25 percent, Waara said. In east Houghton in March, 60 percent of the homes had put out some form of recycling, Waara said. It was about 40 percent in west Houghton. Waara attributed east Houghton’s higher numbers to the higher numbers of students. During Michigan Technological University’s spring break, the recycling tonnage in east Houghton dropped 46 percent, Waara said. In the future, Houghton wants to maintain affordability and increase participation. “We’ve been able to do this thus far without changing our trash rates … we didn’t have to change the bag prices, we didn’t have to change the monthly pickup rate, and the program still pays the bills,” he said. Expanding the recycling program to commercial and business customers is hampered by the lack of space for recyclables dumpsters in downtown. The city is also working on programs for hazardous waste and e-waste, Waara said. “We’re just going to keep working on it, but we’re happy with the way things have gone thus far,” he said. The city pays about $65 per ton for trash and $60 per ton for recyclables. That is one of the rare contracts where recycling is cheap, said Brian Burke of the DEQ. Hancock’s curbside recycling program began about 25 years ago for residential and small commercial customers, City Councilor Will Lytle said. A 2002 report showed about 10% of households were involved in curbside recycling. As of 2016, the city was collecting about 8 tons of recyclables per month. The city moved from monthly pickups to weekly in 2016, when it began a contract with Waste Management. The recycling immediately doubled, Lytle said. Recycling now is around 21 tons a month — 30 percent of the residential and commercial waste stream, he said. Biodegradable yard waste bags are picked up and composted at the Department of Public Works building. “That site is becoming more active for composting, where people are able to take compost out of the system,” he said. In the future, Hancock is looking at working with the CCRI for tires, hazardous waste collection, glass recycling and increasing composting, Lytle said. Hancock is in the middle of an ordinance review, which Lytle hopes will add more green benefits. The city also has an interest in working with other municipalities and county to reduce the amount of items such as hazardous waste being brought into the challenge. Lytle also plugged the 21-Day Plastic Free Challenge, a Michigan Tech-based activity which began on April 1. It challenges people to eliminate single-use plastic for three weeks. Garrett Neese/Daily Mining Gazette Peter Rudnicki, right, performs a coding magic trick, with audience assistant Patrick Heckel, left, during the Copper Country Coders expo at Michigan Technological University Saturday. Graham Jaehnig/Daily Mining Gazette A large hole that opened on an Elm Street section of sidewalk, adjoining the Monkey Business building, has been temporarily covered with an iron plate to reduce the risk of anyone climbing or falling into into what looks to be a basement beneath a vaulted sidewalk. While the hole has been covered, the sidewalk is sinking inward toward the hole.